Definition: The Promotion is a mode of communication that companies use to create awareness among the prospective customers about the product, product line, brand and the company with an objective to generate sales and create a brand loyalty. Informative Promotion: The primary objective of every promotional activity is to disseminate information about the product, product line, brand, and the company. The informative promotion is prevalent at every stage of product life cycle and is an essential ingredient for creating the primary demand. The marketers adopt this promotion strategy to convince customers to try a product at least once. It is based on the notion that the customer will purchase the product only if he has the adequate information about it. 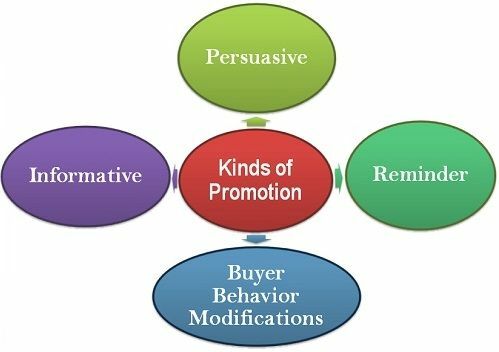 Persuasive Promotion: The persuasive promotion is prevalent at the growth stage of a product where the primary objective of the management is to persuade people to buy. The basic purpose of this promotion strategy is to stimulate purchase and create a positive image of the product in the minds of customers in order to influence their long-term behaviors. Many firms do not adopt this kind of promotion as it involves high-pressure selling. Reminder Promotion: The reminder promotion is often adopted at the stage when a product reaches its maturity. The purpose of such promotion is to keep the product alive in the minds of the customers. Here, the firm emphasizes on the product’s utility, features, brand names with the intent to make customers remind the product. This promotion strategy acts as a “memory jogger” that enables the customers to remember the product and influences their long-term buying behavior. Buyer behavior Modifications: The effect of promotional strategies could be accessed through the modifications in the consumer behavior. The constant personal selling and repeated advertisements could be used to measure the effectiveness of such promotional schemes. Thus, the companies can choose any of the promotions depending on the nature of the product and the pursued objectives.